While living the expat life in Ghana, West Africa, I was once invited to visit the village of a big-time Ashanti chief and have lunch at his palace. Ashante Chief and his entourage, not the chief of this story. An invitation of this order is not nothing and I was expecting this to be an interesting experience. Wouldn’t you? Well, it was interesting, just not the way I had envisioned it. Below is the story. My man and I are in the car driving to Chief Tamakloe’s village for a business meeting to be followed by lunch at the palace. What can I say, I’m excited. The chief, I’m told, is a busy man seeing to his traditional duties in his district as well as running his own saw-mill operation in the village we are visiting, a business that has benefited from my spouse’s expertise in matters of production, management and export marketing. The village benefits from the chief’s mill because it generates jobs and income. My mate tells me that whenever Chief Tamakloe comes to Accra, the capital, for business, he’s dressed in full traditional regalia, which means he wears a multi-colored kente cloth draped over one shoulder, special chief’s sandals, and he brings along an assistant who carries his briefcase. This is how it is done, the proper way. Chief Tamakloe, he tells me, is a very imposing figure commanding respect. I can not wait to meet him. The kente cloths men wear for formal and traditional purposes are magnificent pieces of textile, handwoven with intricate patterns often mixing brilliant oranges, deep yellows, vivid blues and greens. They’re also very heavy and you see the men constantly hoisting the cloth back over their shoulder as the weight makes it slip down. It’s not the sort of garment you put on to go hoeing your fields, trust me. The chief’s village is an ordinary village: mud huts, cement-block houses, rusty corrugated iron roofs, goats, chickens, bare red dirt. Big mango trees and ragged banana plants offer up a cheery green. Little shacks line the road – enterprises of every sort, some painted in lurid colors and wild designs: Simple but Nice, for your sugar and spice. Anointed Hands Beauty Parlour. Psalm 23 Electricals. As in every village, you see barefoot children running around laughing and having a good time, women wrapped in traditional cloths carrying buckets of water or headpans with food or produce, women washing clothes, women sweeping compounds, women hoeing fields, women . . . you get the picture. The men? Maybe they’re truck drivers, or working in the saw mill, or asleep under the mango trees. The saw mill is just outside the village on the other side and we are greeted by the general manager. We are led into an office in a cement-block building. It’s just an ordinary, modest office containing a desk with a phone and a computer and a large table surrounded by heavy wooden chairs for meetings. It’s a bit bare as no fancy art work graces the walls and no potted palms or hanging ferns enliven the room. Then again, this is an African village, so what do you expect? You probably had not expected the phone and the computer, but there they are, fully functioning as I later notice. Various people arrive for the meeting. The production manager, the foreman, and two local consultants. We shake hands, sit down and are offered Nescafé coffee. Then the chief’s car drives up and moments later a tall, big-shouldered man strides into the room, carrying a leather briefcase. He must be in his forties, wears jeans, Nikes and a polo shirt, and apparently has just arrived back in the country from California. Fresh off the British Airways flight from London last night, someone tells me. He doesn’t look anything like you might imagine an African chief to look like (see photo above). He certainly isn’t wearing his kente cloth. He looks more like a basketball coach adored by hormonal college girls and divorced single mothers. We’re introduced and shake hands, after which he sits down at the head of the table and the meeting starts. I leave them to it, move my chair out of the away and read Under the Tuscan Sun while I wait. It feels a bit schizophrenic to immerse myself in rural Italian life sitting here in an African village. But then, that’s not an unfamiliar feeling. There’s a lot of that sort of discombobulation in my life. The meeting concluded, we make a tour of the saw mill, which is interesting, but maybe not to you, so I’ll skip it. Let me just say there’s a lot of noise around, and saw dust, and heat. The tour over, Chief Tamakloe looks at me and gives me a wicked little grin. He’s no dummy this man. He knows I’m dying to go home to Europe and America and tell my friends I had lunch at the palace of an honest-to-god African chief. Be it one wearing jeans, educated at Cornell and just back from California. I wouldn’t have to tell them that, would I? We get in our various cars and drive a short distance to the palace, which is not what you might think a palace looks like. What it is, however, is the biggest building in the village, a large colonial-style mansion with cool, high-ceilinged rooms and a wide staircase leading up to the second floor. In centuries past I assume various colonizing Brits and Dutchmen roamed these rooms before succumbing to malaria (West Africa used to be called White Man’s Grave). We’re ushered into a formal reception room to have drinks first. I glance around. Furniture and rugs galore, all antique and well taken care of by the looks of them. The furniture is of the heavy, carved variety with velvet-like upholstery and lots of gold paint. I’m feeling myself transported to the 18th century. At the end of the room looms the chief’s throne, a high-backed wooden chair of colossal proportions, carved elaborately, painted gold and upholstered in leopard skin. The real deal, I kid you not. 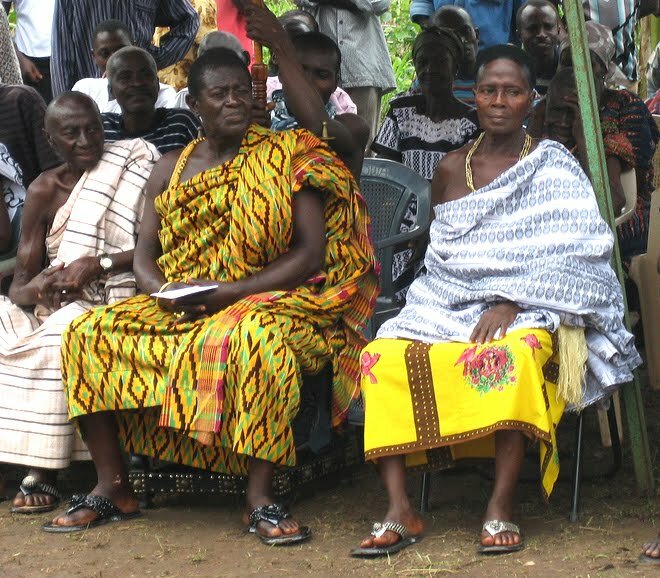 Leopard skin is a big thing among Ashanti chiefs. I gape at it for an inelegant moment, then sit down on a chair nearby and compose myself. The chief strides past me across the Persian carpet and seats his denim behind on the leopard skin throne and plonks his Samsonite briefcase next to his sneakered feet. If only I had my camera. And the guts to be totally uncool and take his picture. What I have to offer is the picture below, not taken by me, but another visitor to another chief’s palace. A servant arrives to ask about our drink requirements and I have a beer like the men. More business talk ensues while I study my surroundings. The windows are ornately draped in heavy flowered curtains. Old ancestral portraits hang on the wall in gilded frames. A sideboard sports crystal and silver decorative objects. One might fancy oneself in Europe a couple of centuries ago. However, there is nothing European about the food we are served in the well-appointed dining room with its massive crystal chandelier. It is a lavish repast of traditional Ghanaian food — spicy chicken and lamb dishes served with boiled yam, fried plantain, rice, soups and sauces. I eat my chicken and the chief addresses me, asking if I like Ghanaian food. And how should I respond to that to an African chief in his palace? “Yes,” I agree. “But very tasty.” This is the truth, red pepper featuring lavishly in the spicing. Fortunately I like red pepper. More business talk circles around the table as we eat and drink. For dessert we have fresh pineapple and paw paw (papaya). Coffee and tea round off the meal. And so comes to an end my lunch with the African chief in jeans and sneakers. Fun surprises, interesting surprises, weird surprises — surely you have been presented with some in your life. Think! Think! Now hit that comment button and tell me about one of yours. I wonder if that cuisine served was his choice, or served because he felt it was expected of him? Left to his own devices would you all have eaten Philly Cheesesteaks? Or California rolls? What a fun tale that was, and what a great experience to have had. Thank you for sharing it with us! Eek! Of course your guy wasn’t named MacAdam. Not if his name was Tamakloe. @ Heather, I always find it so interesting to see the mix of traditional and contemperary cultures. Once I was in a dirt-poor village in Ghana, I mean, nothing but mud huts and there in front of one a big new shiny Mercedes Benz, surrounded (of course) by admiring bare-feet children. And no, it wasn’t my car! @ Truestarr, oh thank you! What a nice thing to say! @ Victoria, welcome! I’ve got lots of stories. Oh this was a fun story! I myself am always fascinated by the clash of times/cultures we see in our travels…the nomad on his cell phone, the camel transported in the back of a pick-up truck. Once, my husband was surfing in Mauritania (where I saw the first two things I mentioned), and he pulled out of the wave and saw a herd of camels on the beach, all staring at him. We’d see men in traditional robes in offices and men in suits at the beach. You lead a fascinating life! I have posted an award for you on my blog. Thank you for all the “sunshine” you send my way!